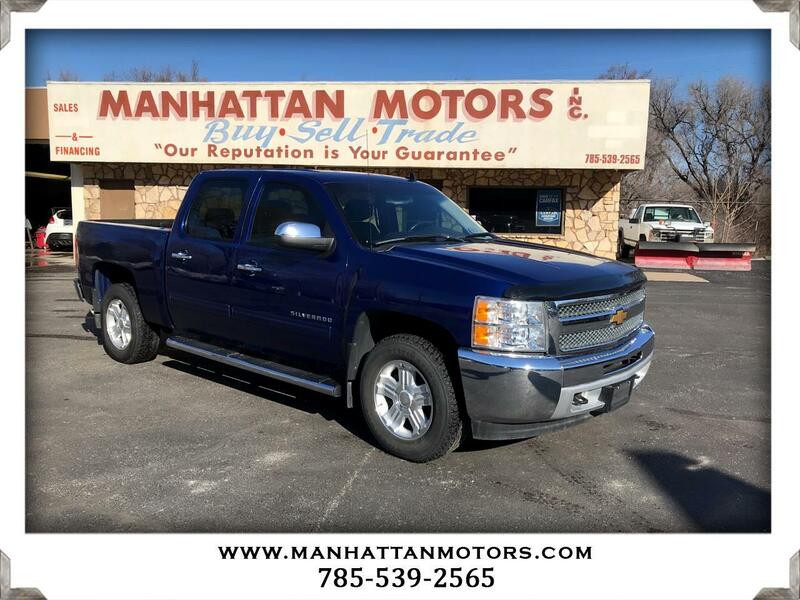 Our Accident Free 2013 Silverado 1500 LT Crew Cab 4X4 is shown in a rugged and beautiful Blue Granite Metallic. Powered by our proven Vortec 5.3 Liter V8 offering 315hp while connected to a smooth shifting Automatic transmission that helps with easy passing and towing demands. This Four Wheel Drive scores near 21mpg on the highway and owners love the coil over shock front independent suspension as it takes the machine out of the truck and provides you with a nimble work machine. This Chevrolet will exceed your towing or hauling requirements and certainly remind you that solid-like-a-rock really does exist. The exterior is highlighted by chrome bumpers/grille, running boards, bright wheels, and a tonneau cover. This LT supplies comfortable cloth seating with upscale elements generally found in expensive luxury brands. Power accessories await you along with a leather-wrapped steering wheel with mounted controls, easy to read gauges, an impressive sound system, and climate control that adds to the prestige. The well-known GM safety features are in place to protect you, your family and your cargo. Stabilitrak, 4-wheel ABS, daytime running lamps, and plenty of airbags have one combined mission, your safety. Print this page and call us Now... We Know You Will Enjoy Your Test Drive Towards Ownership! Thanks for choosing Manhattan Motors. We recently won The Manhattan Mercury Readers' Choice Award for being the #1 Used Car Dealer. Buyers enjoy our "laid back" approach. No test drive routes or high-pressure salesmen. Our focus is to offer all of the information you need to help make the best decision for your family or business. Each one of our vehicles undergoes a 30-point vehicle inspection by Burnett Automotive, Manhattan's #1 Auto Service Facility. We are also the area's only Independent USAA Certified Dealer, offering discounts on purchases and interest rates. Manhattan Motors has been serving the greater Manhattan community with their affordable and reliable vehicles since 1983. Call 785-539-2565, text 785-477-5096 or stop by 1826 Tuttle Creek Boulevard, Manhattan, KS 66502 to see what makes us different than your typical used vehicle dealer. For additional inventory, please visit www.ManhattanMotors.com.